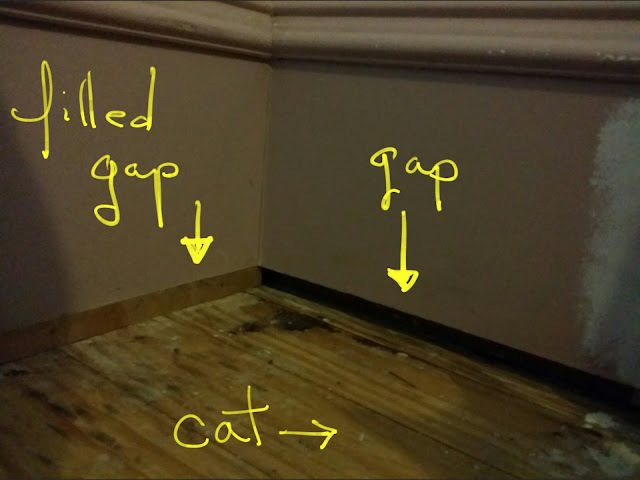 Removing all those layers of flooring in the kitchen left a big gap under the baseboards. It's made it hard to keep the house a comfortable temperature (well, in addition to the shortage of insulation). At first I thought I'd lower the baseboards and then place quarter-round along the edges, but that's a lot of work so instead I opted to just cut some 3/4" plywood scraps down and fill the gaps with that. The seams will be covered with quarter-round anyway and I won't lose any height to the baseboards, which is good because they are a little short anyway (only 8.5"). Shortening them would have made them a little unbalanced with the 10' ceilings.